SEOUL, Jan. 25 (Yonhap) -- Gyeonggi Gov. 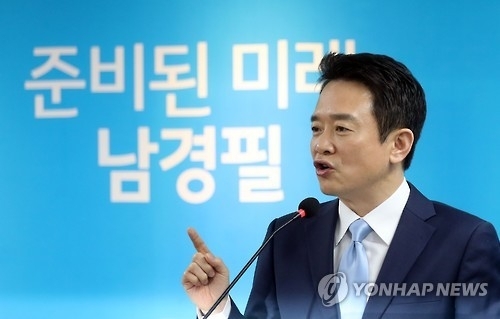 Nam Kyung-pil of the Bareun Party announced his intention to run in the next presidential election on Wednesday, declaring his vision to "rebuild" the country by eradicating corruption, reforming chaebol and crafting a job-based welfare system. "We need to change the old tradition of revering presidents and high-ranking officials like kings, along with the top-to-bottom system," Nam said. "Such a vertical system is a violent custom that protects the privileged and the old system." Nam is one of two major potential presidential candidates from the conservative splinter party, along with Rep. Yoo Seong-min. The party was launched Tuesday by lawmakers and politicians who left the ruling Saenuri Party. The governor said he will focus efforts on creating more jobs. "For the past two years, 292,000 jobs have been created in Gyeonggi Province. Last year alone, there were 154,000 new jobs. More than half of the new jobs opened in the country in 2016 were from the province," Nam said. Nam said he will guarantee "the right to work" to all South Koreans, even including the handicapped or retired seniors. The governor also hinted at bringing reform to the South Korean economy heavily dependent on family-controlled conglomerates, or chaebol. "We need to break away from the chaebol-dominated economy that lacks entrepreneurship of innovation and challenge," Nam said. Nam said he will seek to provide an opportunity for "basic work" to all people, instead of the basic income proposed by some liberal candidates. Nam also has been advocating hard-line security policies, including the development of nuclear weapons to improve defense capabilities against North Korea. The governor also claimed South Korea should shift to a volunteer military system from the current conscription, in line with the falling birthrate. As Seoul is still technically at war with the North, all physically fit men between the ages of 18 and 35 must serve in the military for about two years. "South Korea rebuilt will no longer be a weak country that minds neighboring powers. It will not agonize between the United States and China," Nam said, declaring he will push for an end to the hegemonic system in Northeast Asia. "The Seoul-Washington alliance is important for our security, and it will remain so in the future. But we also need willingness and efforts to seek a South Korean model of self-reliant defense, which will make the alliance even worthier," Nam said. South Korea may hold its presidential election earlier in 2017 instead of December as President Park Geun-hye was impeached last month due to a corruption scandal. Once the Constitutional Court approves the ouster, the country will pick a new leader within 60 days. Nam said if he is elected as the president, he also wishes to invite former U.N. Secretary-General Ban Ki-moon to his administration. Ban currently stands as the most favored potential candidate in the conservative bloc. "There is no other figure that holds great personal networks and experiences as Ban in the area of diplomacy and security," Nam said. The governor said he will also join forces with other party leaders. Nam, formerly a five-term lawmaker, said he is not concerned about his low approval rating in opinion polls, claiming it will pick up down the road. An opinion poll conducted last week showed he held an approval rating of 1.1 percent.